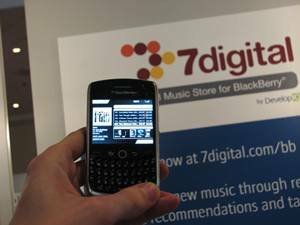 Research in Motion (RIM) and 7Digital has teamed up to launch an online music download service soon for BlackBerry handset. According to 7Digital marketing manager, the music will be available for free download. The quality of the music will change depending on the network; there will be download at lower bitrate AAC tracks on 3G network for save time and up to 320Kbps MP3 download while on Wi-Fi network. Besides, a sync feature is also included for connecting the phone to a computer over Wi-Fi to transfer without requires a USB link. To be able to complete with competitors such as Apple and Nokia, RIM will skip the subscription services for $0.99 per track or $9.99 per typical album, no matter whether user is accessing from a Blackberry handset or a PC. In addition, 7Digital has a library of six million tracks with the majority DRM-free. The online music download is expected to be launched concurrently in September in the UK, US, Canada, France, Italy, Germany and Spain.